A tip especially for yellow-toned ladies! A way to tone down a bright pink lipstick on the cool side is to apply a gloss of a warmer shade on top of it. 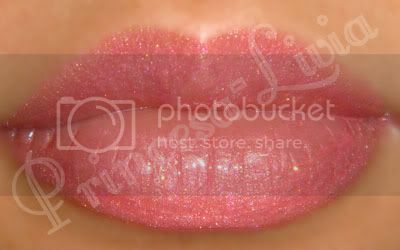 By 'warmer', think of glosses with a slightly yellow or orange tone to them, as opposed to ones with cool tones such as blues, lilacs and bright blue pinks. This is what I've done with the bright pink MAC Bombshell lipstick, with MAC Love Nectar lustreglass over it. Gorgeous gorgeous gorgeous!!!!!!!!!!!!!!!!!!!! I shall purchase Bombshell l/s sometime!